This is the tenth (or so) post about Feynman diagrams, there’s an index to the entire series in the first post. These are things we know that we know. That is to say, there are things that we know we don’t know. But there are also unknown unknowns. There are things we don’t know we don’t know. Ignoring originally intended context, this statement describes not only the current status of the Standard Model, but accurately captures all of our hopes and dreams about the LHC. We have “known knowns” for which our theories have remarkable agreement with experiment. In this post I’d like to summarize some of these in the language of Feynman diagrams. There are also “known unknowns” where our theories break down and we need something new. This is what most of my research focuses on and what I’d like to write about in the near future. Today let’s focus on the “known knowns,” the things that we’re pretty sure we understand. There’s a very important caveat that we need to make regarding what we mean by “pretty sure,” but we’ll get to that at the bottom. The “known knowns” are what we call the Standard Model of particle physics*, a name that says much about its repeated experimental confirmations. * — a small caveat: there’s actually one “known unknown” that is assumed to be part of the Standard Model, that’s the Higgs boson. The Higgs is currently one of the most famous yet-to-be-discovered particle and will be the focus of a future post. In the meanwhile, Burton managed to take a few charming photos of the elusive boson in his recent post. First, let’s start by reviewing the matter particles of the Standard Model. These are called fermions and they are the “nouns” of our story. Let’s focus on only the highlighted first column. This contains all of the ‘normal’ matter particles that make up nearly all matter in the universe and whose interactions explain everything we need to know about chemistry (and arguably everything built on it). The top two particles are the up and down quarks. These are the guys which make up the proton (uud) and neutron (udd). 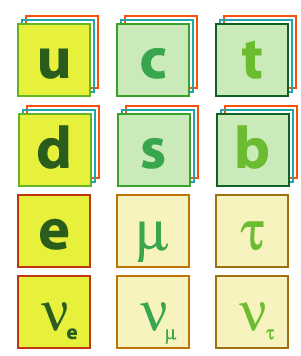 As indicated in the chart, both the up and down quarks come in three “colors.” These aren’t literally colors of the electromagnetic spectrum, but a handy mnemonic for different copies of the quarks. Below the up and down we have the electron and the electron-neutrino (?e), these are collectively known as leptons. The electron is the usual particle whose “cloud” surrounds an atom and whose interactions is largely responsible for most of chemistry. The electron-neutrino is the electron’s ghostly cousin; it only interacts very weakly and is nearly massless. So those are all of the particles. As we mentioned in our first post, we can draw these as solid lines with an arrow going through them. You can see that there are two types of leptons (e.g. electron-like and neutrino) and two types of quarks (up-like and down-like), as well as several copies of these particles. In addition, each particle comes with an antiparticle of opposite electric charge. I won’t go into details about antimatter, but see this previous post for a very thorough (but hopefully still accessible) description. We will refer to these forces by the ‘theories’ that describe them, but they are all part of the larger Standard Model framework. For historical reasons, physicists often write the photons as a gamma, ?. Photons are massless, which means they can travel long distances and large numbers of them can set up macroscopic electromagnetic fields. As we described in our first post, you are free to move the endpoints of the vertex freely. At the end of the day, however, you must have one arrowed line coming into the vertex and one arrowed line coming out. This is just electric charge conservation. In addition to the electron, however, all charged particles interact with the photon the same vertex. This means that all of the particles above, except the neutrinos, have this vertex. For example, we can have an “uu?” vertex where we just replace the e‘s above by u‘s. QED is responsible for electricity and magnetism and all of the good stuff that comes along with it (like… electronics, computers, and the US LHC blog). This is a somewhat antiquated name for the weak force which is responsible for radioactivity (among other things). There are two types of force particle associated with the weak force: the Z boson and the W boson. Z bosons are heavier copies of photons, so we can just take the Feynman rule above and change the ? to a Z. Unlike photons, however, the Z boson can also interact with neutrinos. The presence of the Z plays an important role in the mathematical consistency of the Standard Model, but for our present purposes they’re a little bit boring since they seem like chubby photon wanna-be’s. We have written a curly-L to mean a charged lepton (e, ?, ?) and ?i to mean any neutrino (?e, ? ?, ??). An explicit set of rules can be found here. In addition to these, the quarks also couple to the W in precisely the same way: just replace the charged lepton and neutrino by an up-type quark and a down-type quark respectively. The different copies of the up, down, electron, and electron-neutrino are called flavors. The W boson is special because it mediates interactions between different particle flavors. Note that it does not mix quarks with leptons. QCD—besides holding matter together and being a rich topic in itself—is responsible for all sorts of head aches from both theoretical and experimental particle physicists. On the experimental side it means that individual quarks and gluons appear as complicated hadronic jets in particle colliders (see, e.g. Jim’s latest post). On the theoretical side the issue of strong coupling (and the related idea of confinement) means that the usual ‘perturbative’ techniques to actually calculate the rate for a process quickly becomes messy and intractable. Fortunately, there are clever techniques on both fronts that we can use to make progress. Everything we’ve reviewed so far are known knowns, these are parts of our theory that have been tested and retested and give good agreement with all known experiments. There are a few unknown parameters such as the precise masses of the neutrinos, but these are essentially just numbers that have to be measured and plugged into the existing theory. There’s one missing piece that we know must either show up, or something like it must show up: the Higgs boson. I’d like to dedicate an entire post to the Higgs later, so suffice it to say for now that the Higgs is an integral part of the Standard Model. In fact, it is intimately related to the weak sector. The importance of the Higgs boson is something called electroweak symmetry breaking. This is a process that explains why particles have the masses that they do and why the W, Z, and photon should be so interwoven. More importantly, the entire structure of the Standard Model breaks down unless something like the Higgs boson exists to induce electroweak symmetry breaking: the mathematical machinery behind these diagrams end up giving nonsensical results like probabilities that are larger than 100%. Incidentally, this catastrophic nonsenical behavior begins at roughly the TeV scale—precisely the reason why this is the energy scale that the LHC is probing, and precisely the reason why we expect it to find something. By specifying the above particles and stating how the Higgs induces electroweak symmetry breaking, one specifies everything about the theory up to particular numbers that just have to be measured. This is not actually that much information; the structure of quantum mechanics and special relativity fixes everything else: how to write down predictions for different kinds of processes between these particles. But now something seems weird: we’ve been able to check and cross-check the Standard Model in several different ways. Now, however, I’m telling you that there’s this one last missing piece—the Higgs boson—which is really really important… but we haven’t found it yet. If that’s true, how the heck can we be so sure about our tests of the Standard Model? How can these be “known knowns” when we’re missing the most important part of the theory? More generally, it should seem funny to say that we “know” anything with any certainty in science! After all, part of the excitement of the LHC is the hope that the data will contradict the Standard Model and force us to search for a more fundamental description of Nature. The basis of the scientific method is that a theory is only as good as the last experiment which checked it, and there are good reasons to believe that the Standard Model breaks down at some scale. If this is the case, then how can we actually “know” anything within the soon-to-be-overthrown Standard Model paradigm? This is not as weird as one might think. Consider the classical electromagnetic field of a point particle: it is a well known curiosity to any high school student that the potential at the exact location of the point source is infinity. Does that mean that an electron has infinite energy? No! In fact, this seemingly nonsensical prediction is classical electromagnetism telling us that something new has to fix it. That something new is quantum mechanics and the existence of antiparticles, as we previously discussed. This doesn’t mean that the effective theory is no good, it only means that it breaks down above some region of validity. Despite the existence of quantum mechanics, the lessons we learn from high school physics were still enough for us to navigate space probes to explore the solar system. We just shouldn’t expect to trust Newtonian mechanics when describing subatomic particles. There’s actually a rather precise sense in which a quantum field theory is “effective,” but that’s a technical matter that shouldn’t obfuscate the physical intuition presented here. For physicists: the theory of the Standard Model without a Higgs is a type of non-linear sigma model (NL?M). This accurately describes a theory of massive vector bosons but suffers from a breakdown of unitarity. The Higgs is the linear completion of the NL?M that increases the theory’s cutoff. In fact, this makes the theory manifestly unitary, but does not address the hierarchy problem. For an excellent pedagogical discussion, see Nima Arkani-Hamed’s PiTP 2010 lectures. The particles and interactions we’ve described here (except the Higgs) are objects and processes that we have actually produced and observed in the lab. We have a theory that describes all of it in a nice and compact way, and that theory requires something like the Higgs boson to make sense at high energies. That doesn’t mean that there aren’t lots of open questions. We said that the Higgs is related to something called “electroweak symmetry breaking.” It is still unknown why this happens. Further, we have good reason to expect the Higgs to appear in the 115 – 200 GeV range, but theoretically it takes a “natural” value at the Planck mass (1019 GeV!). Why should the Higgs be so much lighter than its “natural” value? What particle explains dark matter? Why is there more matter than anti-matter in the universe? While the Higgs might be the last piece of the Standard Model, discovering the Higgs (or something like it!) is just the beginning of an even longer and more exciting story. This is at the heart of my own research interests, and involves really neat-sounding ideas like supersymmetry and extra dimensions.